The Horizon 2020 CENTAUR project has developed an innovative solution to the increasing problem of urban flooding, a problem that has the potential to affect thousands of people in urban areas around the world. The developers say CENTAUR™ is an intelligent, autonomous, localised system which uses existing drainage network storage capacity for urban flood risk reduction and similar applications. Water industry professionals appear to agree that CENTAUR™ could be a major step forward in alleviating urban floods. The system was recently awarded the ‘Most Innovative New Technology of the Year’ at the 2018 Water Industry Awards, a prestigious event that celebrates and rewards outstanding achievement and innovation in the UK water industry. The CENTAUR™ system has been successfully installed and working in Coimbra, Portugal, managing peak flows and reducing flood risk in an important area of the city. CENTAUR™ uses data driven approaches to develop real time control strategies to activate existing in sewer storage at the local scale. Sophisticated computational techniques are combined with specially designed flow control devices to reduce flood risk. It uses storage capacity within existing infrastructure at low cost or in situations where space and capital are not available. This capacity is targeted at reducing flood risk, environmental impact, and/or energy consumption. A major benefit is the short deployment times that require little planning permission, avoiding the disruption of large civil engineering schemes. Once installed, it is self-managing and autonomous. System operation can be observed on the web, showing live system status and integrity. Furthermore, the system offers flexibility as it is modular and extensible. 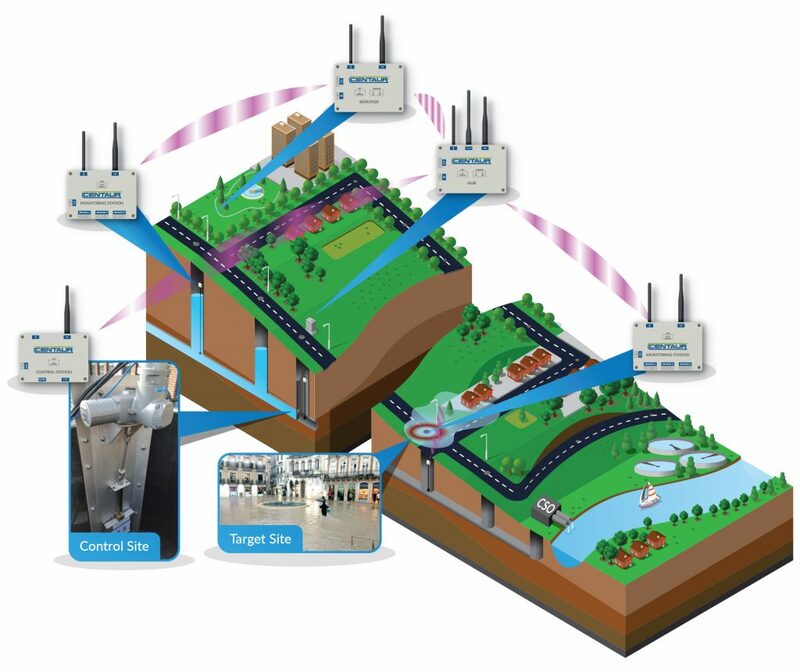 It can be implemented gradually where several CENTAUR™ systems form an intelligent wastewater network. The system has also been designed with multiple fail-safes. This results in net reduction of risk rather than transferring risk upstream. The CENTAUR project involves 2 Universities (University of Sheffield and University of Coimbra), one research centre (EAWAG Aquatic Research), 2 SMEs (Environmental Monitoring Solutions and Steinhardt GmbH) and 2 water utility companies (Veolia and Águas de Coimbra E.E.M).